Headlines that 356 serving army personnel have taken the unprecedented initiative of petitioning the Supreme Court of India (SCI) against “persection” is extremely worrying, to put it mildly. This comes after the Supreme Court directed the CBI SIT to file chargesheets against army personnel allegedly involved in extra-judicial killings in Manipur. No right-thinking officer would support a soldier (here meaning the middle-level and junior officer, JCO and Jawan) shooting at any person in the course of counter-insurgency operations (CI Ops), unless he himself is under threat of being attacked. At the same time it must be recognized that the soldier on CI Ops lives daily under extreme stress of existential uncertainty since, being in uniform, he is an easily recognizable target, whereas he has no way of knowing who may attack him and when, where or in what manner. Such an attack coming from within a crowd or gathering of people or from a hiding place, could be by fire from automatic weapons, grenades, IEDs, etc., that could kill or maim him for life. Thus, the insurgent or militant has the initiative and the soldier is at an initial disadvantage. In these conditions, the soldier is trained to not shoot until either he is shot at or otherwise attacked, or when he is reasonably certain that he will be attacked. It is not, repeat not, possible for the soldier to operate in the hope that the insurgent will open fire and miss his target, or wait till he or his comrade is wounded or killed, before he returns the fire or takes cover to assess the situation and take further action. A bullet takes milliseconds to snuff out life, and so decisions to shoot or not to shoot have to be taken “on the run”. The niceties of legality and fair play in such situations can only be observed in the safety of physical or professional distance from the scene of risk and action. Parliament enacted AFSPA in 1958 because of the felt need for deployment of the military for IS duties. Governments invoke this law to deploy the military for the state’s internal security. It requisitions the military for deployment precisely because the state and central police forces have failed to maintain law and order, and the local or regional security situation is beyond its control. India’s military being under civilian control, army deployment on CI Ops is at the civil administration’s initiative, after issuing a gazette notification declaring an area as “disturbed”. The civil administration invokes AFSPA because the soldier cannot use weapons against civilians without its mandate. That the army has been operating in CI Ops continuously for decades highlights the continuous, abject failure of governance at the Centre and State levels over those decades. There has been continued absence of honest politics of discussion, dialogue or negotiation with all stakeholders to the conflict situation. 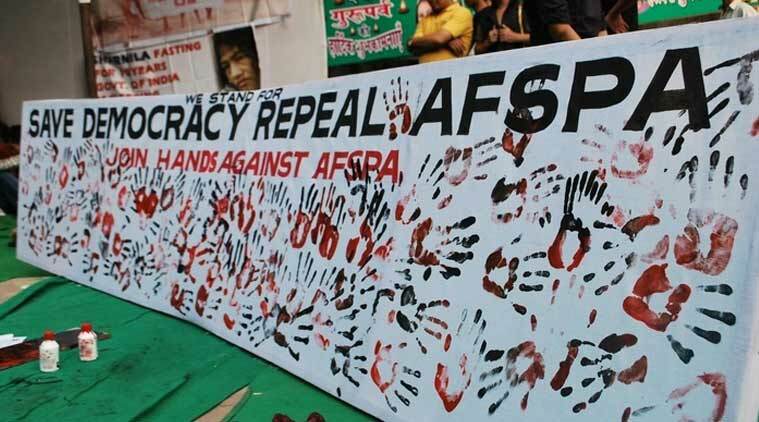 Further, corruption in and politicization of state and central administrations including state police and CAPF respectively, have caused governments to declare areas as “disturbed” and invoke AFSPA. It does not call for much imagination to understand that the army is governments’ instrument of last resort to protect the nation’s integrity, since if the army fails, government has no recourse left. But sadly, successive governments at state and centre right up to the present, appear not to understand this naked truth. Worldwide history, and experience of continued army deployment for CI Ops in India since the 1950s, shows that use of police or military force cannot solve political problems in the long-term. The soldier cannot operate in CI Ops without the legal shield of AFSPA, but has no stake in continuing in this role. The matter of 356 soldiers taking the initiative of knocking at the door of the SCI raises several troubling questions. Has the soldier lost confidence in his higher officers, that they have collectively taken the extremely career-hazardous and institutionally dangerous initiative of going over their heads to petition the highest court of the land? Such an initiative could not have been taken all of a sudden, especially when over 350 serving personnel have acted together. A competent higher commander should know about the rumblings among the soldiers who are under his command in the stressful deployment of CI Ops. Does the initiative constitute a failure of command at some level? Has the higher military and political leadership been kept abreast of these rumblings? Where does the buck stop? One cannot help recalling the numerous instances of failure of moral courage at high levels of military command mentioned by Norman Dixon in his seminal work titled “On the Psychology of Military Incompetence”. The initiative indicates that the soldier feels that he is being prosecuted unjustly despite the applicability of AFSPA. Whatever decision the SCI may take, it appears that the soldier is at the end of his tether. The soldier will fight with whatever he has, the shortage of critical items of military hardware and equipment notwithstanding. It can be safely claimed that the Indian soldier is matchless. But the best soldier can fail when higher military and political leadership is lacking. One can only hope that the situation, which will surely please India’s enemies no end, is not beyond “repair”. Coming on the top of several statements and actions at different political levels which have effectively lowered the status or the izzat of the military, this initiative portends grave ill for India’s instrument of last resort, and thereby for India. All fake encounters are murders. But these are committed by soldiers or ordinary police personnel on the orders of higher officials. These authorities must be made accountable for their actions .